These Affordable Table Skirts and Collapsible Counters are Priced to Sell! Find the Linen Throws You Need in the Vast E-Store! Choose from Table Skirts in Multiple Configurations! 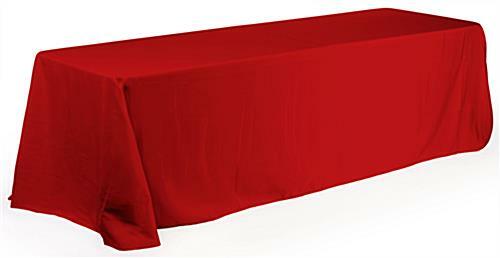 Red polyester table cover includes certificate showing the material is fire retardant. 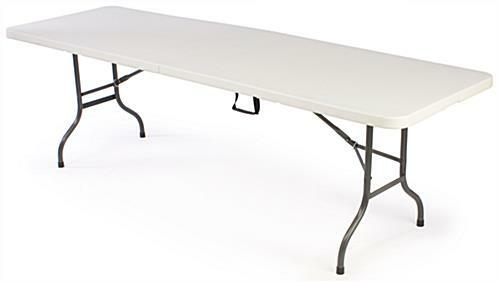 Folding Tables collapse small for easy transport and storage. (3) Sided table cover leaves room on one side for sitting or placing boxes. Table skirts are ideally used at retail stores, trade show venues, and convention centers for conveying a professional appearance to potential clients. These portable tables measure 96" x 29" x 30" but fold into a smaller 48" x 30" x 3-5/8" size, which is perfect for storage and transport. 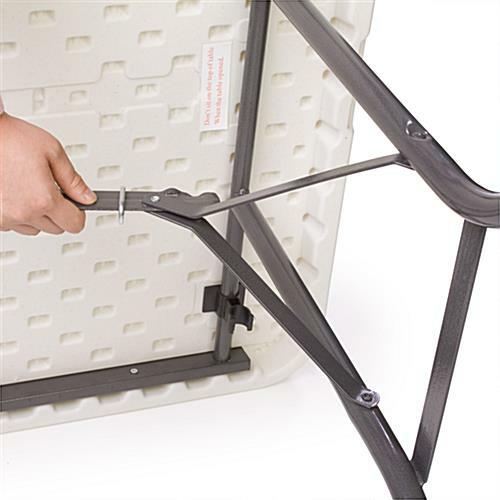 A nylon handle built into the table skirt surface to make carrying the unit easy. There are no tools required for assembly; simply pull the legs out and slide the metal collars into place. Trade show furniture for table skirts is made from injected molded plastic and reinforced with steel to create a durable display that can be used for years to come. This plastic is stain-resistant and easy to clean. Portable tables like these red polyester table skirts. This covers are fire retardant. These event tables, table skirts are covered by fabric on (3) sides, with the fabric hanging within 2" of the floor. The back of the fabric hangs down 6" to leave plenty of space for people to sit with chairs. Purchase table skirts today to enhance your next trade show appearance with a great looking display that is affordable.